It used to be all I ever saw were tarot decks; tarot decks that held pretty tight to the template set by the Universal Waite Tarot Deck. Then I noticed tarot decks that meandered off that path at times, and occasionally I saw sets of runes. Then it was oracle decks, that conformed in no way to the traditional tarot, and I saw I Ching sets. It seems for every person out there awaits a type of oracle just for them! And I’m here today to introduce you to another wonderful member of this expanding family, “Tokens of Light”. “Tokens of Light” is subtitled “66 Paths for insights and prediction according to the Hebrew Alphabet” and it was created by Orna Ben-Shoshan. Astute readers will remember that name from back in April 2011 when I reviewed the “King Solomon Oracle Cards“. Orna was responsible for the beautiful artwork found in that deck, and I’m happy to say “Tokens of Light” is perhaps an even better space for her art. 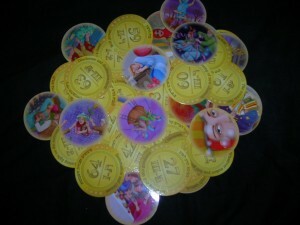 The tokens are 66 sturdy coins (made of a slightly more sturdy stock than tarot cards). One side of the coin has its number, 1-66, (The total number of 66 was derived by using 3 different aspects of each one of the 22 Hebrew letters.) and underneath it a Hebrew letter with a serial code to which the answer relates. The other side has a beautiful Orna Ben-Shoshan illustration to help you make a visual connection with the coin. The coins come with a pretty drawstring bag to use for carrying, storage, or pulling the tokens from for readings. You don’t need to be able to read Hebrew to use “Tokens of Light”. Thank goodness! The set comes with an interpretation booklet that gives you some ideas as to what drawing a particular coin might mean, and also some different suggested ways to use “Tokens of Light” for guidance. Despite its beautiful, mysterious, occult appearance, it’s pretty freakin’ simple to use. How about one more “Thank goodness!”? Along with the tokens, you also get two amulet coins that are not to be included in your readings, but kept close to you. One coin contains the priestly blessing for protection and fulfillment of your wishes, and the other coin contains letter combinations taken from the “72 Names of God” that will bring balance and success to all areas of life. “Tokens of Light” is a unique addition to the expanding landscape of oracle products. To learn more about it, visit their site.